Just in time for the beginning of the PGA Championship from Whistling Straits. I’m very excited to announce that Qlik is collaborating with PGA.com to produce an interactive data visualization app for the PGA Championship teeing off on August 13thfrom Whistling Straits in Kohler, Wisconsin. The official PGA Championship Data Visualizer, powered by Qlik, will provide a look into player performance data in real-time allowing you to track scores, strokes, putts, driving distance, fairway accuracy and more. The app provides unprecedented access to the data behind player performance for the fourth and final major golf championship of the year. Follow live as Jordan Spieth attempts to become the first golfer since Tiger Woods in 2000 to win three major championships in a year. Through the PGA Championship Data Visualizer’s player comparison tool, you will be able to follow Jordan’s round-by-round play against other players and the field. You can also see how Spieth and other players are trending from day-to-day and dive deeper into their performance statistics with drive distance and accuracy data. How will he compare to defending champion Rory McIlroy, for example? Will The Open champion Zach Johnson repeat his success from St. Andrews? How will Qlik sponsored Henrik Stenson perform? The app is embedded on PGA.com using the Qlik Analytics Platform. The Qlik Analytics Platform can be used to extend the reach of business intelligence (BI) strategies to partners and customers via their extranet and internet sites, fostering greater collaboration and interaction through data. The platform is comprised of the QIX Associative Data Indexing Engine, direct API access to the QIX engine, management level back-end APIs, and an application toolkit to create a data model, build expressions and leverage the Qlik charting engine. The Qlik Analytics Platform provides developers with the tools to create everything from simple web mashups with charts to more complex integrated web applications. 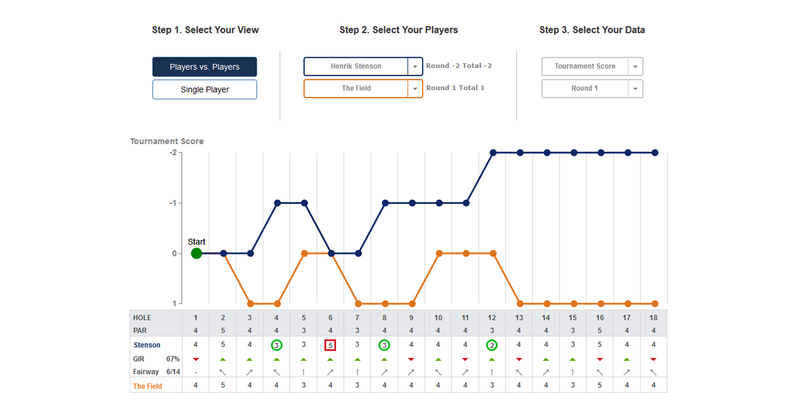 The PGA Championship Data Visualizer provides us with a unique way to showcase the Qlik Analytics Platform and how Qlik is bringing its vision of analytics for everyone to life. Please take a look, share with your friends and fellow golf fans and most importantly if you have other ideas and suggestions for how we can showcase the power of Qlik don’t hesitate to let us know!